Robin Thicke paid an emotional visit to the grave of his late father Alan Thicke. The Growing Pains star passed away suddenly in December 2016 after suffering a heart attack. He was 69. 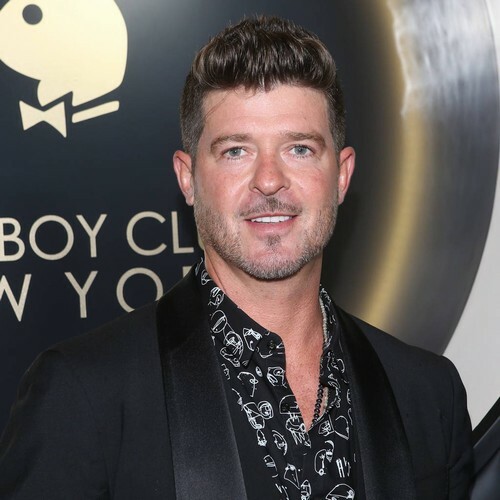 And in tribute, the Blurred Lines singer, 41, took his two children, son Julian and daughter Mia, to his father’s resting place and shared a photo of the emotional moment on Instagram. In the heartbreaking snap, Robin’s eight-year-old son can be seen kneeling down and placing sunflowers around the edge of his grandfather’s gravestone while Mia, eight months, is sat on a blanket. Robin shares Julian with his first wife Paula Patton. He and current girlfriend, April Love Geary, have daughter Mia and are expecting another baby. The Grammy nominated singer had a close relationship with his father, and after his passing, he remembered Alan in a post on Instagram. “He was the best man I ever knew. The best friend I ever had. Let’s all rejoice and celebrate the joy he brought to every room he was in. We love you Alan Thicke. Thank you for your love. Love, your grateful son,” he wrote at the time. Recently, Robin opened up about Alan’s death during a Television Critics Association panel.